Bayern and Franck Ribery have come to terms on a new contract after Munich lost the Champion’s League Final to Inter on Saturday. The word was that he would leave Munich this summer, but now a new 5-year deal keeps him in place. 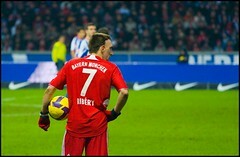 I guess this means that the allegations of Ribery being a client in a prostitution ring are not so bad for Bayern. Frankly, I can’t blame them. If he’s your guy–then he’s your guy. That’s pretty much that. You don’t look very hard when have good players right in front of you. However, I still think there are problems with Ribery’s alleged link to underaged prostitution and that fact that he missed the Champion’s League final–even though it really wasn’t his fault–it’s still hard. The only real problem I have with that is that he could have signed sooner. If he liked his family in Munch so much then he could have done this deal a long time ago. So, the insinuation that you’re 100% happy to be staying is pretty ludicrous. I think we all know that some teams don’t want to mess with him now. Moreover, does this really mean that Bayern can make it back to the Champs League Final? I don’t think so. It only means they kept their best player and they lucked into the Final this year.